SIGMA Corporation adds two more Full Frame cine lenses at NAB. Covering incredibly wide and extremely tight, the new cine lenses in the SIGMA FF High Speed Prime Line are 14mm T2 FF and 135mm T2 FF. Download 4-page FDTimes PDF article, including visit to SIGMA Headquarters and interview with lens designers. There are now seven prime lenses in the SIGMA FF High Speed Prime Line: 14, 20, 24, 35, 50, 85, and 135mm. The seven new SIGMA Cine Lenses will be available to test at SIGMA’s NAB Booth C11525. They join the SIGMA 24-35mm T2.2 FF Zoom along with SIGMA Super35 format 18-35mm T2 and 50-100mm T2 High Speed zooms. All these cine lenses come with PL, EF and E-mounts. (Only the 24-35 T2.2 FF Zoom lacks a PL mount option: it comes in EF and E-mount only.) SIGMA offers a mount conversion service. They have been exchanging mounts on their still photography lenses for quite some time. For a modest fee, if you change cameras or change your mind, they can swap between EF and E-mounts. The reason for having this service done by the manufacturer or their authorized service facilities is that the EF and E-mount have electronic contacts for lens data as to focal length, aperture, distance, etc. The Mount Conversion Service is not available for PL mount lenses. SIGMA cine lenses come with a choice of metric or imperial focus scales that can be changed later on for a small fee. The standard version has luminous text identifying focal length and speed (e.g. 18-35 T2), and the rest of the numbers and marks are white. There’s a fully luminous option that includes all numerical markings on the lens barrels. Among the smallest, lightest, fastest Full Frame Cine lenses available. T1.5 or T2 for entire range. That is remarkably fast for Full Frame lenses, especially of this small size and weight. SIGMA FF lenses cover 24x36mm image area, 43.3mm diameter.Of course, they cover S35 as well. Artistic look—these lenses are derived from SIGMA’s acclaimed Art series of still photography lenses. Color matched across entire range. High resolution— planned for 50 MP sensors and beyond. The new 14mm T2 FF and 135mm T2 FF Cine Lenses are based on SIGMA’s stellar new 14mm f1.8 DG HSM and 135mm f1.8 DG HSM Art lenses introduced in February at CP+. The 14mm f1.8 was heralded as the world’s first and only f1.8 ultra-wide angle Full Frame interchangeable lens. 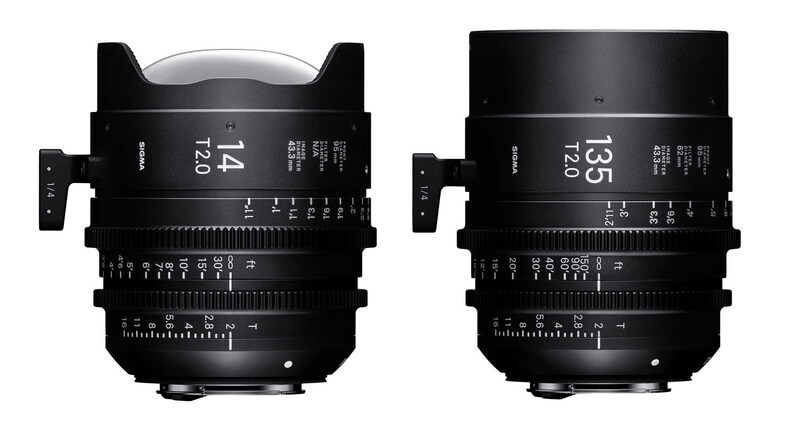 The design philosophy from SIGMA’s Art line of still photography lenses is carried forward into their new cine lenses. Everyone at the company, from CEO Kazuto Yamaki to the designers, planners, optical and mechanical engineers, made many references to a process of fulfilling artistic expression. SIGMA describes the new 14mm T2.0 FF Cine Lens: “It is made of three FLD (‘F’ Low Dispersion) glass elements and four SLD (Super Low Dispersion) glass elements to help minimize transverse chromatic aberration, which tends to be noticeable in shots taken with ultra-wide-angle lenses. Offering excellent peripheral brightness, this lens delivers outstanding image quality from the center to the edges. The new lens features a large 80mm diameter precision-molded glass aspherical lens as its front element. “This technology has made possible the 14mm T2 full frame specification—the first of its kind, and effectively minimizes distortion. Offering excellent peripheral brightness, this lens delivers outstanding image quality from the center to the edges. The SIGMA CINE 135mm Full Frame telephoto lens provides a signature compression effect with dramatic, round bokehs. The designers write, “By minimizing axial chromatic aberration, the SIGMA 135mm T2 FF delivers superb contrast and sharp image quality all the way to the edges of the lens. Resolution is of such clarity that individual hairs can be discerned in a portrait, while at the same time, skin textures are beautifully smooth and have a cosmetic quality, while backgrounds become pleasantly blurred and out of focus highlights are rendered in gorgeous bokehs.